If you want to have some fun with trick-or-treaters, you might do what my nephew did one year when he was a teenager. First, he persuaded his parents to turn off all the lights and pretend no one was home. The scarecrow was really my nephew in a costume and mask. When the trick-or-treaters got close enough, he’d leap up to personally offer them a treat. And he’d scare the bejeebers out of them. My sister and her husband were peeping through the curtains, and she said they were dying of laughter. It was a great trick. This would probably work with any kind of costume – witch, ghost, pirate – but not clown. Do not dress up as a clown this year. Clowns are creepy. It would definitely startle! 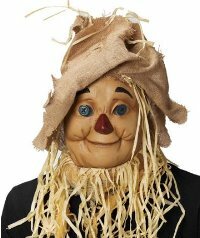 I think a scarecrow would be especially persuasive in these parts because people do make scarecrows and prop them up, but I guess the others would work too so long as people thought it was just a straw-stuffed witch, ghost, pirate, etc.